First off, thank you, Jaye, for inviting me to be a part of this blog tour. I immensely enjoyed participating in the release of Resistance, Book 1 in the Ilyon Chronicles series; for more details on that, along with a character interview with Emperor Daican, check out my post here. 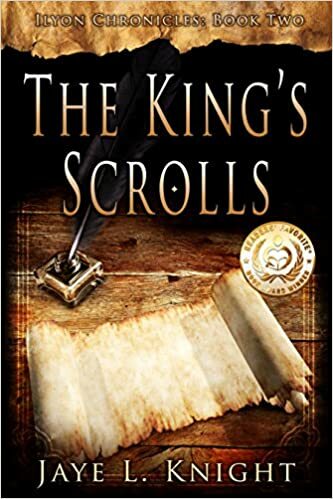 Secondly, an added dose of thanks to Jaye for a complimentary e-ARC of The King’s Scrolls in exchange for my honest review and participation in the tour. As always, all opinions are my own. Thirdly, spoilers abound ahead; ye be warned. The text color has been changed to white so you’ll just need to select the text to read it. 😉 I’ll make sure you know where they are! And now … the moment we’ve been waiting for. The book. The review. The interview. And the giveaway. Steady on! Ohhh, my. Let me preface this by noting that I read key scenes of The King’s Scrolls the day after the Seahawks lost the Super Bowl. That was not a good move on my part, because I was emotional already. And some of these book scenes were gut-wrenching. I needed Kleenex. And I don’t cry when I read books; come to think of it, I’ve only cried reading one other book, Mary Beth Chapman’s Choosing to SEE. Well, I’ve effectively doubled that count with The King’s Scrolls. One of the things I like to do while reading a book is to do a mental casting of characters, picking an actor/actress for a mental image of that person. Some TKS characters were easy; Jace, to me, has always been a young version of the cover art character from Linda Chaikin’s Heart of India series. He shares the same name as the male lead in Chaikin’s series, as well as several physical characteristics. Leetra was also easy; I picture her played by Jaimie Alexander (Lady Sif of “Thor” fame). Other casting was hard. The jury is still out for Kyrin and Kaden; Kyrin reminds me of Jennifer Lawrence’s Katniss Everdeen (but a million times cooler), and Kaden? He’s the brother everyone wants to have. (Which makes me think of Liam Hemsworth …) You see my problem? I am looking forward to the next (and the next) re-read, not only to finalize my mental casting, but to capture every nuance and character development that I can. You see, this book is not one that you read once and put back on your shelf (or, heaven forbid, sell elsewhere); no, this is one that you read again and again, because you can’t get enough. You know the plot; you know what happens to the characters; and every time, you cross your fingers, wondering if it’s going to happen. King’s Scrolls readers by default will channel You’ve Got Mail‘s Meg Ryan, who reads Pride and Prejudice repeatedly, and every single time, she aches to find out whether Elizabeth and Darcy will truly end up together. King’s Scrolls is the fantasy version of P&P; Jaye, I must once again, finally, thank you for inviting me along with you on this journey. The read – which is, inevitably, my first of many – has done my soul a world of good. TKS is, of course, Book 2 in a series. What was easier or harder about writing TKS/a sequel compared to The Resistance/book 1? Jaye: I think, being most of the characters were already established, that made TKS a bit easier to write. Resistance was a big discovery period, and while it was fun and exciting, working everything out made it a bit harder. It was nice to have a solid foundation while writing TKS. The emotional parts were definitely harder though. This is the most emotional book I’ve ever written. Emotions can be really hard because you want to get them just right. Ok … this next question/answer is just one big spoiler alert. Highlight all the text to read the full question and answer. Several characters die in TKS. (AAAAAAHHHH.) Did you anticipate this from the get-go? Did anything catch you by surprise? Jaye: Sadly, I knew William was going to be martyred before I was even finished writing the first chapter of Resistance. It was one of the first major details I knew about the series. I didn’t know why or how it would happen exactly, I just knew it would. Writer’s intuition you might call it. Josan’s death was more of a surprise for me. In my original plan for the book, Timothy did not exist, so Josan was truly the teacher they were looking for, therefore I didn’t intend to have him die. But then, when Timothy came into the picture once I started working on the book, things changed. We discover Timothy’s true role in the development of the King’s Scrolls. I was struck by your choice of name for him, and the parallels between him and another Timothy, the biblical youth who worked so closely with Paul. Was this intentional? Jaye: Yes, this was intentional. 🙂 I’ve long had a deep interest in Timothy, so that was a huge inspiration for me as I was creating Timothy’s character in TKS. I decided pretty much right away that I would use the same name. Speaking of names … we see throughout the series both familiar names, like Timothy or Aaron – even Jace! – but others are unique to this series and more fantastical, such as Kyrin or Talas. Do you have a particular process for choosing character names? There are some very difficult (in a good way!) scenes to read in TKS, very emotional, really. [Guess what! One last spoiler alert!] Falcor’s betrayal, his stabbing of Talas, William’s execution, etc. I remember feeling absolutely gutted reading these, and can only imagine how it must have been to write them. Was it hard for you? Jaye: Excruciating! [Yep. Spoilery.] William’s execution was the hardest thing I’ve ever written. :’( I cried every single time I worked on it. I’ve never done that before, and I don’t cry easily. It was incredibly hard because he was one of my favorite characters. I really, really didn’t want to do it. I even had several desperate moments of wondering if there was any way I could possibly change it. But it was sadly necessary. It still makes me teary though. Haven’t begun the adventure into Ilyon? From February 17th – 23rd, get Resistance, the award-winning first book of Ilyon Chronicles for your Kindle on sale for only 99 cents! Check it out on Amazon! Missed part of the tour, or curious what’s ahead? Check out all the participating blogs here! I loved reading the spoiler-y pieces… since I’ve already read the book, it was neat to get that additional insight into why Jaye wrote it as she did and the process of writing it, I didn’t know the W****** scene was coming even from that early in writing the series… And to read about the evolution of the Jo*** scene was neat too. You are so correct – this is a book where you’re on edge for what will happen even if you’ve already read it multiple times. You still hope it turns out differently in places…but it the end, you just couldn’t change a single thing.